This semester 4/3 Stephensen have been involved in the S.E.A.T Project. This is a values-based program that empowers students to explore their own potential to enhance the world in which they live. It stands for Sustainability, Education, Art and Teamwork. The program centres on the parable of ‘The Little Stool That Could’ to demonstrate the values and actions achievable by the students who participate. The culminating event is an exhibition of decorated seats that reflect the students’ achievement of the content and process of the program. All of the 4/3 classes have been involved in the S.E.A.T project and have a foundation or charity they wish to help. We were inspired by the work of Shelter Box and how they provide aid for countries suffering from natural disasters. The sale of the 4/3 Stephensen seats will be going towards this charity. We’d love for the S.E.A.T Project to inspire our whole community and get everyone involved. 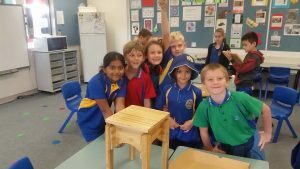 The sale of the stools will be through SILENT AUCTION this Saturday 8th December at Parap Markets. Bidding will open at 8AM and final bidding closing at 2PM. All proceeds will be donated to the chosen charities.